Despite the onslaught of a severe depression, Antonio Sivori got a job in early 1874 as the steward of the Union Square Hotel. The area near the park had by then become largely commercial. In 1870, the jeweler and stationer Tiffany & Co. moved to 15th Street from its old location at Broadway and Broome Street. 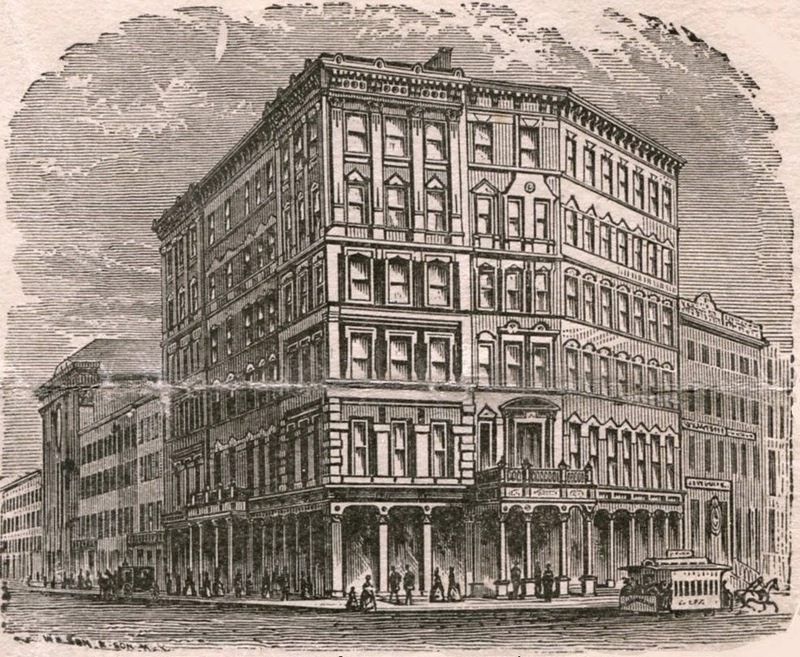 It was also around this time that the Union Square Hotel and its adjoining theater opened on the corner of Fourth Avenue and 15th Street, occupying the site where one of the finest boarding houses in the city once stood. Of the forty-five menus supposedly saved by Sivori, seventeen come from this hotel on Union Square, reflecting the social cachet of the fashionable neighborhood. 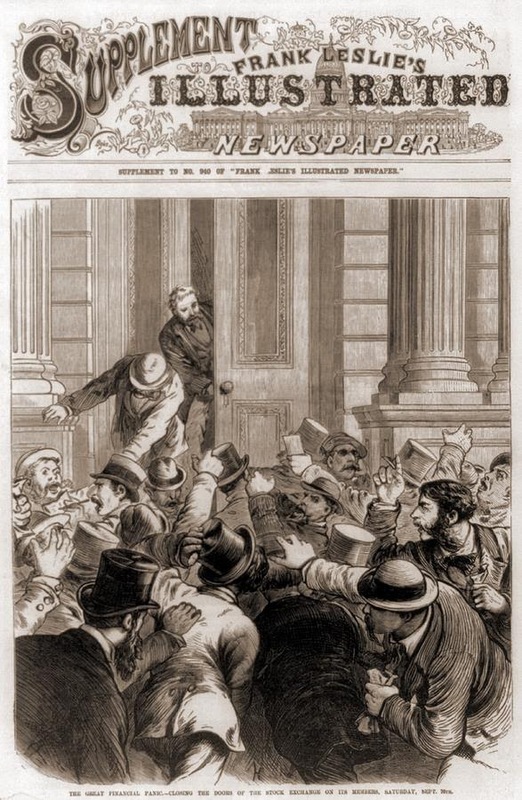 The earliest one below is from an unidentified event on September 8, ten days before the Great Panic of 1873. 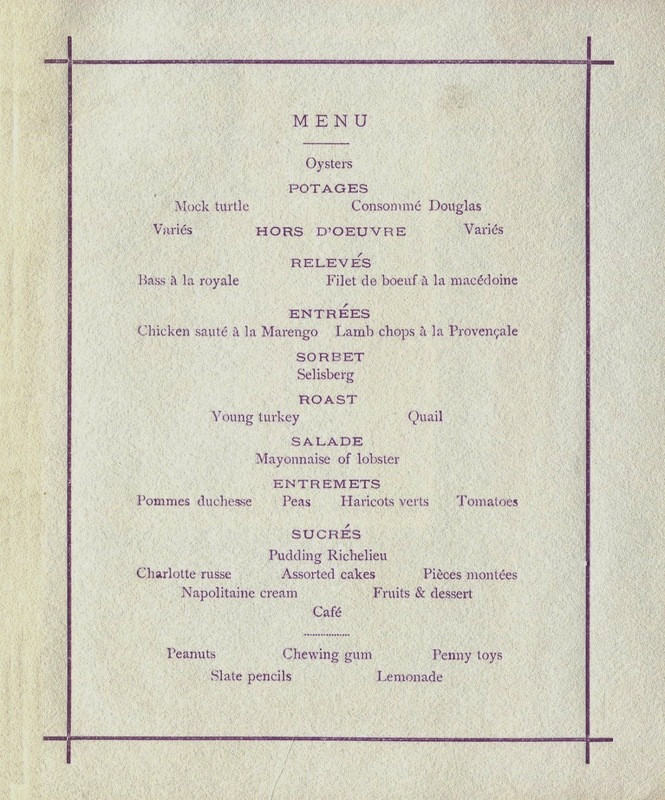 The entrée on this menu named ortolans en caisse, à la Perigueaux was probably made with a native reed bird, cooked in a porcelain oval and flavored with a rich brown sauce with Madeira and truffles. The real ortolan is a finch-like bunting that lives in Europe. Following a culinary ritual, these tiny songbirds are trapped in nets in southwest France, cruelly fattened, drowned in Armagnac, roasted, and eaten whole by gourmets with linen napkins draped over their heads to capture the aromas from the sizzling fat. 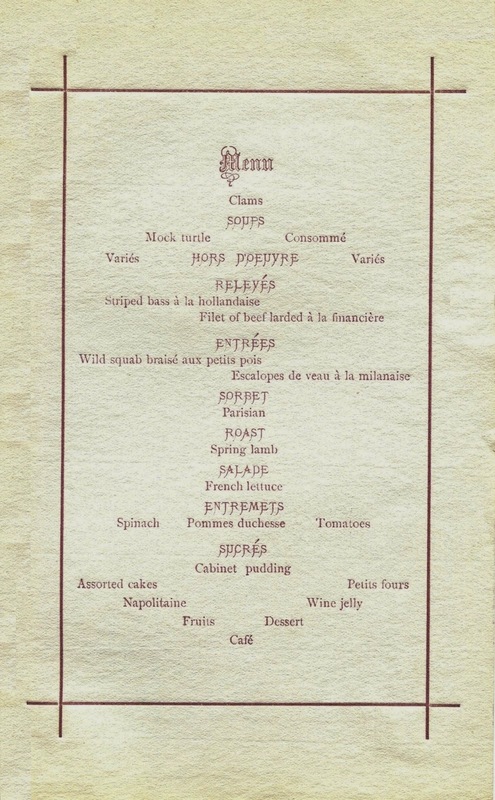 In the United States, hotel stewards occasionally used the word “ortolan” to give their bill of fare a touch of class. The alumni of Grammar School No. 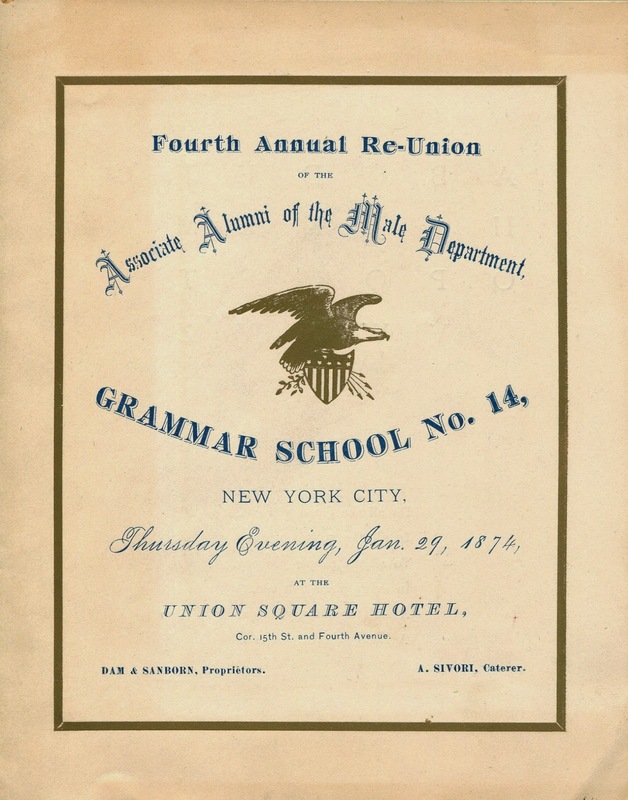 14 held their fourth annual reunion on January 29, 1874. 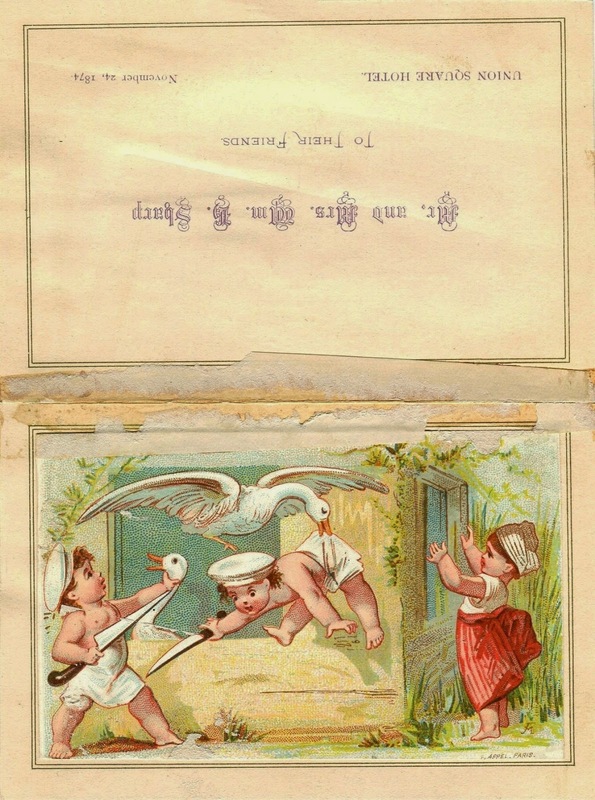 The menu below features an alphabet chart and a children’s poem, sparking nostalgic memories of their school days. Despite the profusion of oysters in the coastal estuaries of New York, this dinner opens with “salt oysters” from Massachusetts, the briny oysters harvested in places like Wellfleet and Cape Cod Bay. 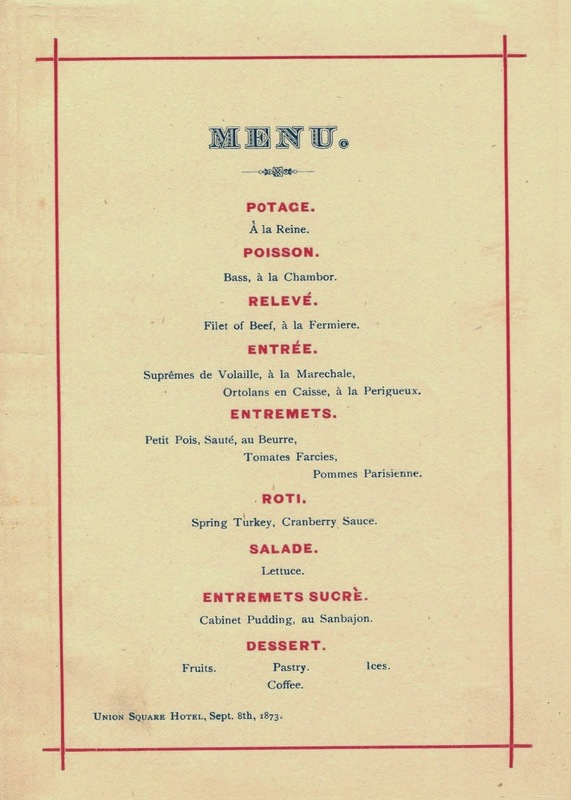 There are also some relatively expensive foods, such as the larded sweetbreads with peas, which were three and a half times more expensive than lamb chops according to the annotated menu from the St. James Hotel in 1870. 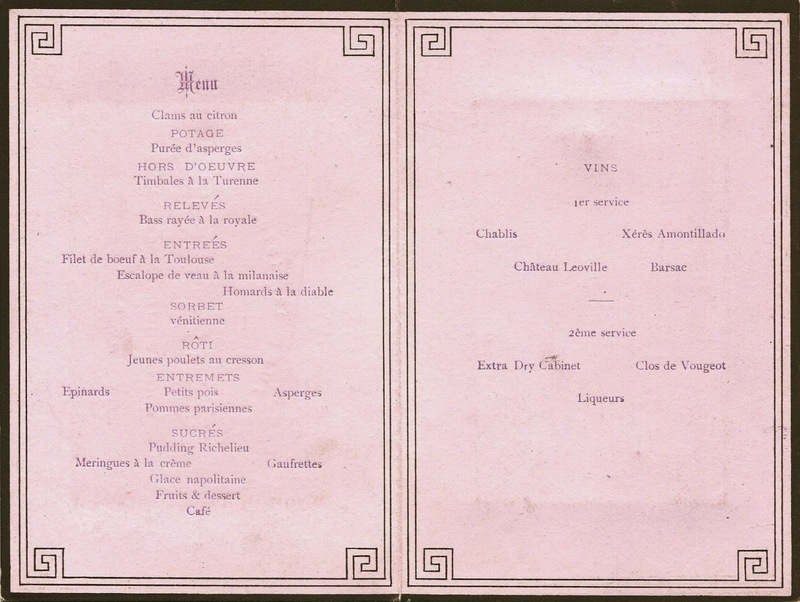 The above banquet was held on the same evening as one of the Delmonico dinners, suggesting that Sivori was still working for both establishments. 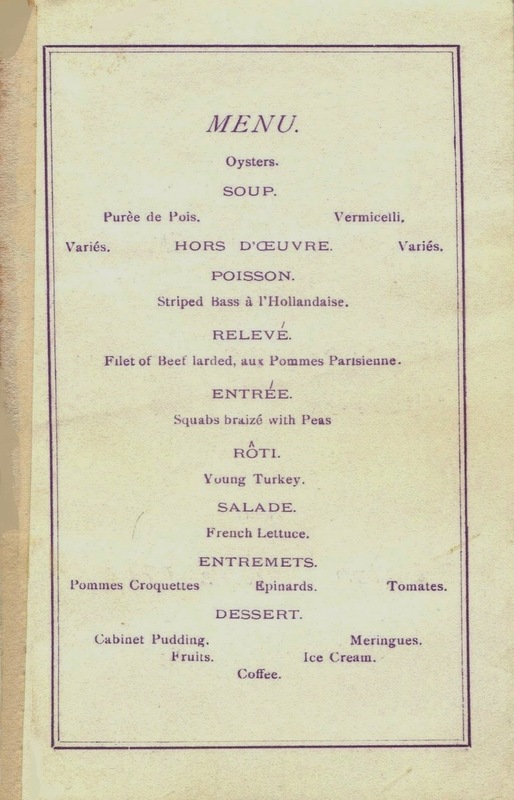 Although he is shown as the “caterer” on this menu, Sivori is named as the “steward” on the menu below from the following month, indicating that he had become a full-time employee of the hotel. Whether called a caterer or a steward, it was his job to compose the menu, organize the event, and supervise the staff. 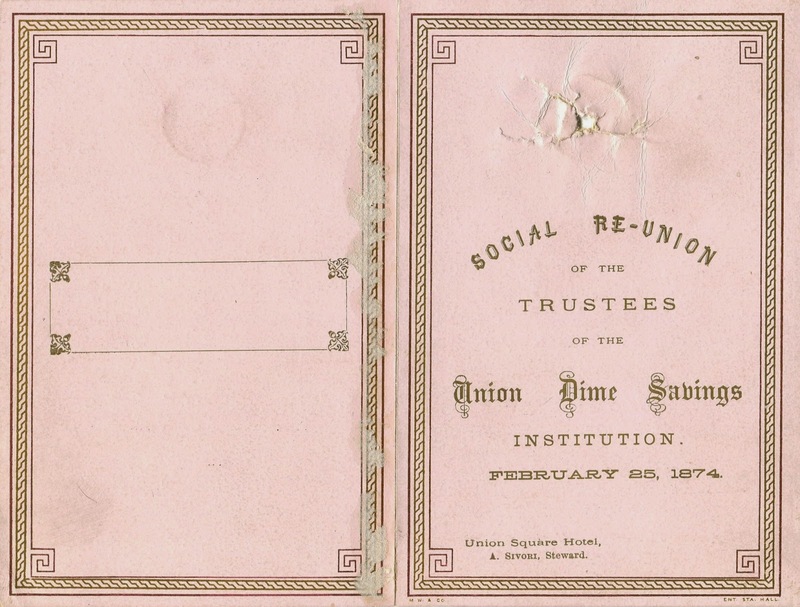 Perhaps celebrating their survival, the trustees of the Union Dime Savings Bank held a surprisingly lavish dinner on February 25, 1874, only five months after the bank reserves in New York plummeted from $50 to $17 million, immediately following the Great Panic. 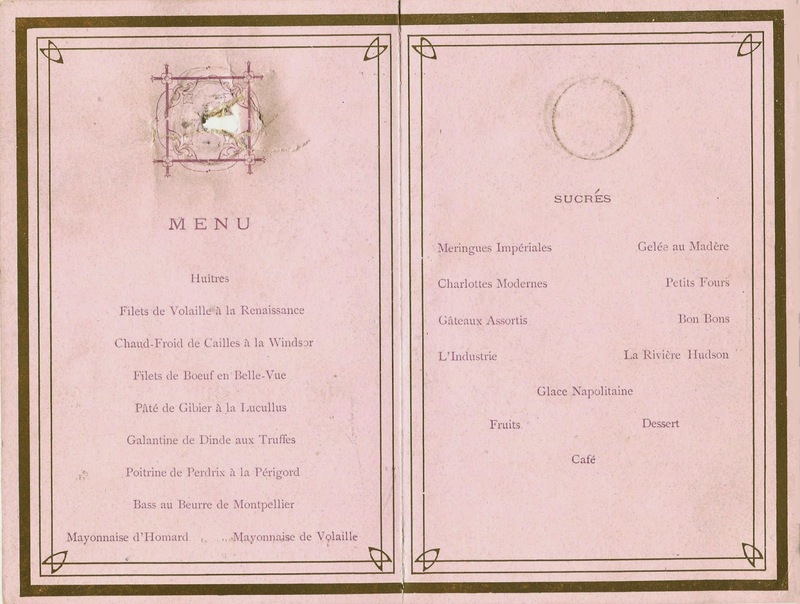 The hole and circular impression indicate that a dime was once attached to this menu, seemingly as a reference to the name of the bank. By the time of this banquet, hundreds of banks across the country had failed. 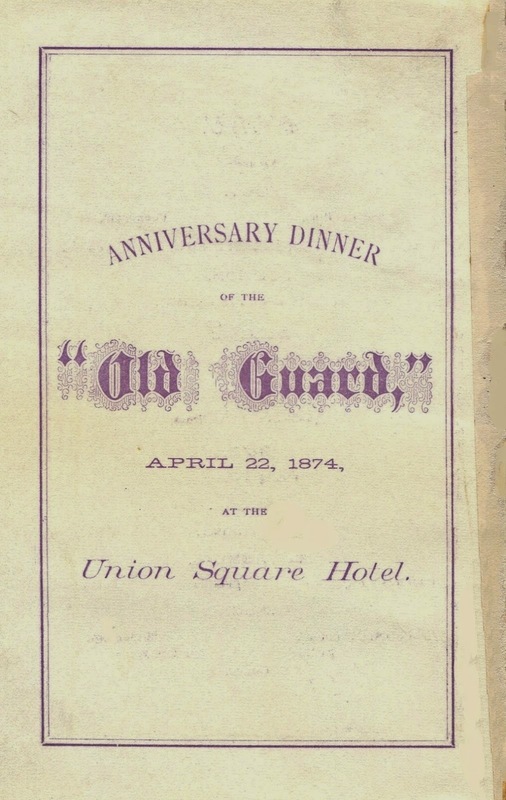 The bill of fare below comes from a veterans reunion of the Third Infantry Regiment in April 1874. Known as the “Old Guard,” this regiment was transferred that year from the Western frontier to the South so that it could participate in the ongoing occupation of the former Confederacy, not knowing that Reconstruction would only last three more years. In the meantime, General George A. Custer led an expedition in 1874 to the Black Hills of Dakota to investigate the area’s natural resources. 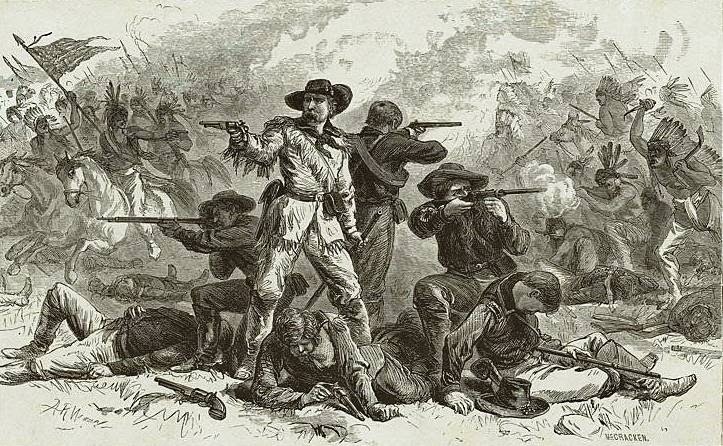 Soon after gold was discovered, miners began to stream into the sacred hills of the Sioux, raising tensions in the area. A couple named “Mr. and Mrs. William Sharp” hosted this private dinner at the hotel for their friends on November 24, 1874, two days before Thanksgiving. At the time, entertaining friends at home was not an option for most members of the upper-middle-class living in Manhattan. Houses were prohibitively expensive and multiple-unit tenements, which did not include private toilets, were not considered suitable. Typically, when someone outgrew their boarding house, they moved into a hotel where more than half of the occupants might be permanent residents. The collective nature of social life in New York began to change in the late 1870s, when apartment buildings appeared on the scene. 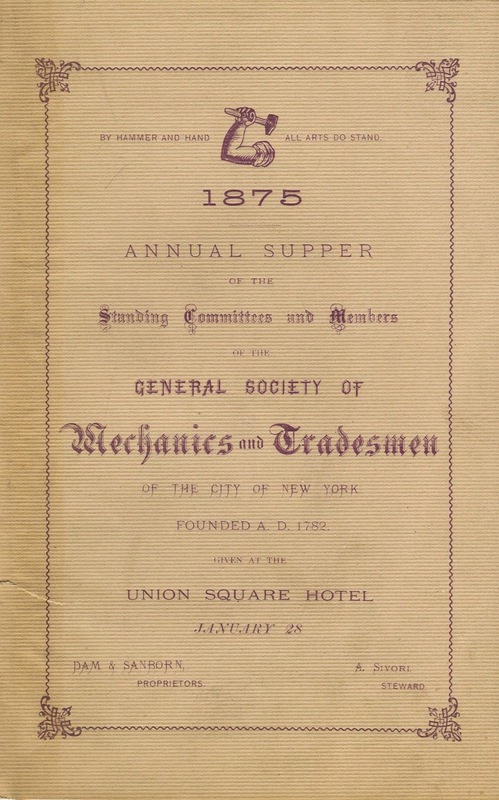 The Union Square Hotel was selected by the General Society of Mechanics and Tradesmen for its annual banquet on January 28, 1875. Organized ninety years earlier at Walter Heyer’s Tavern on Pine Street (then King Street) near Broadway, this social society operated a night school, providing technical training for young men employed during the day. 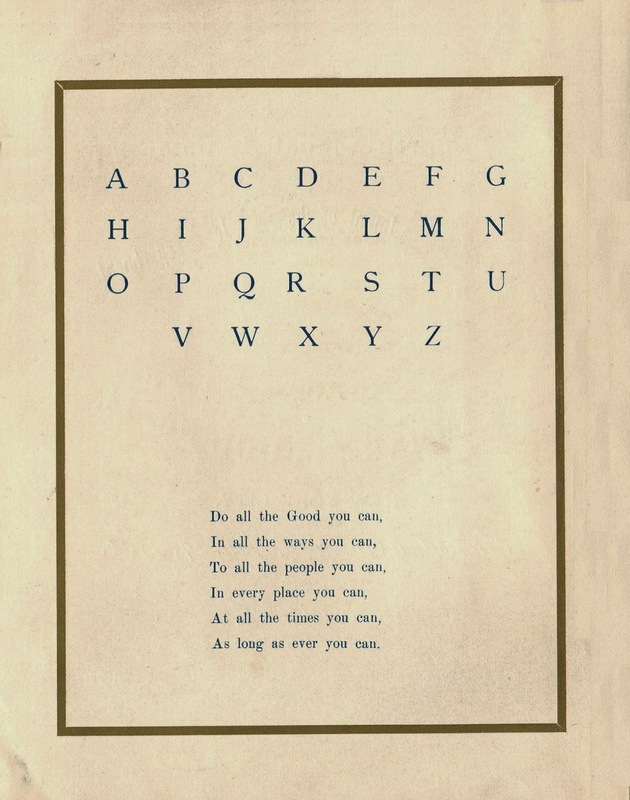 Three years later, it began offering courses in stenography and typewriting to women. Prior to the 1870s, the typical business office was a small operation, totally staffed by men; by 1900, more than a third of all clerical workers in the United States were women. When the “male alumni” of Grammar School No. 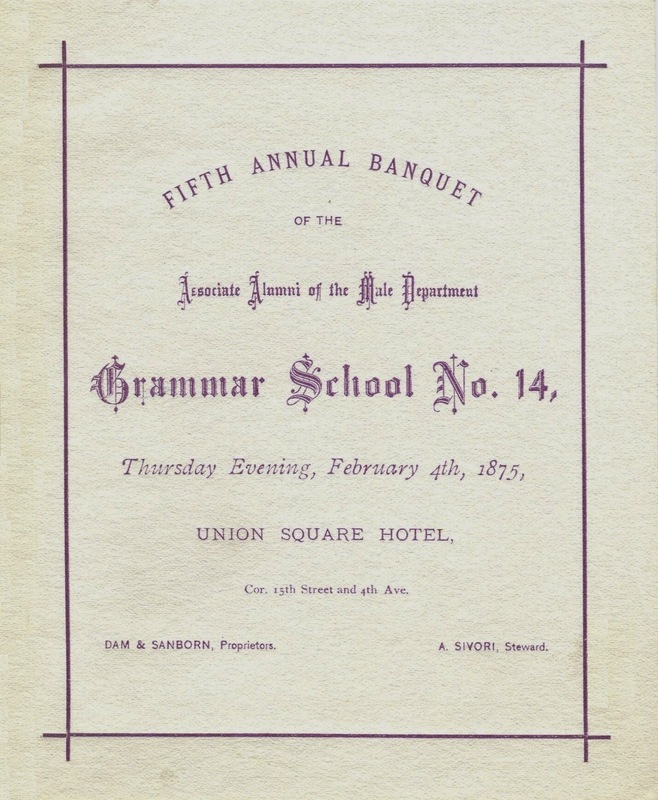 14 convened for their fifth reunion in 1875, the menu was again designed to spark nostalgic memories of their school days, listing at the bottom an array of childhood items like chewing gum, penny toys, and slate pencils, along with peanuts and lemonade. Located on East 27th Street, this public school also had a “female department.” Four months after this dinner, the 84-year-old philanthropist Peter Cooper and the principal, Miss Caroline Whiting, then completing her fortieth year of service at the school, presided at the graduation ceremony for twenty-eight young women. 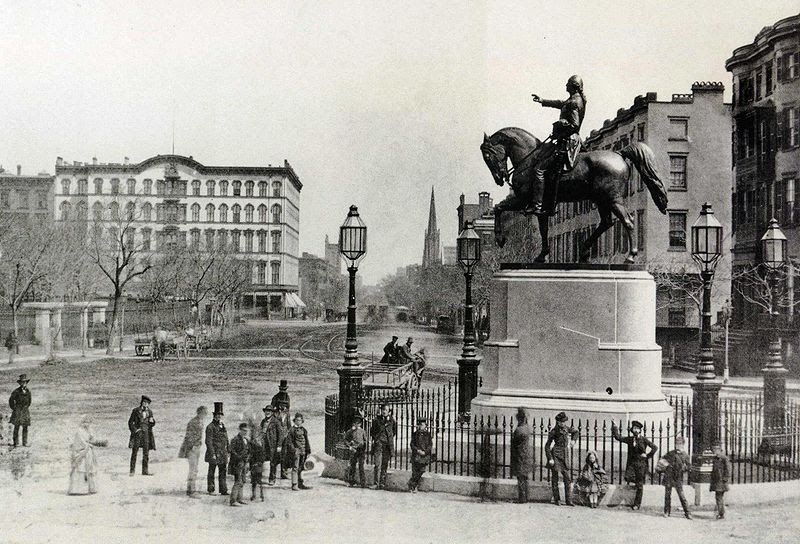 New York was a leader in universal and compulsory education, passing a statue in 1874 requiring children from ages 8 to 14 to attend fourteen weeks of school each year. 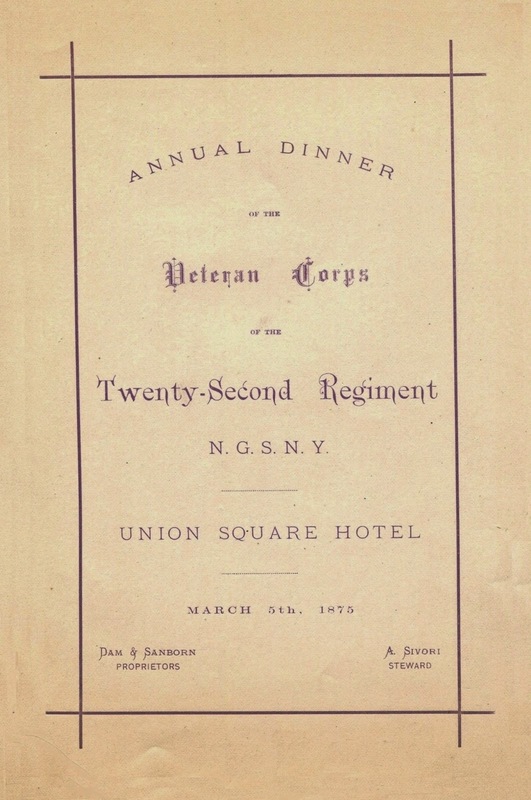 Throughout the nineteenth century, veterans of the Civil War held annual reunions like this one by the 22nd New York Volunteer Infantry Regiment in March 1875. Sivori served in the 55th New York Volunteer Infantry Regiment during the war. Called the Gardes Lafayette, this predominantly French-immigrant regiment was known for its French Algerian-style Zouave uniforms.1 Since many of the men in this unit previously worked in the kitchens of the city’s hotels and restaurants, it is not surprising that Sivori joined the 55th, or that this unit became well-known for its good food. 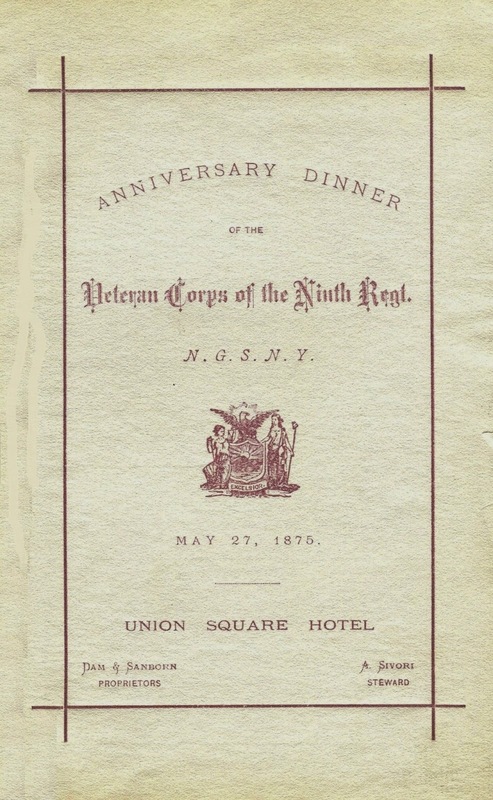 The anniversary dinner of Veteran Corps of Ninth Regiment of the New York National Guard was held on May 27, 1875. 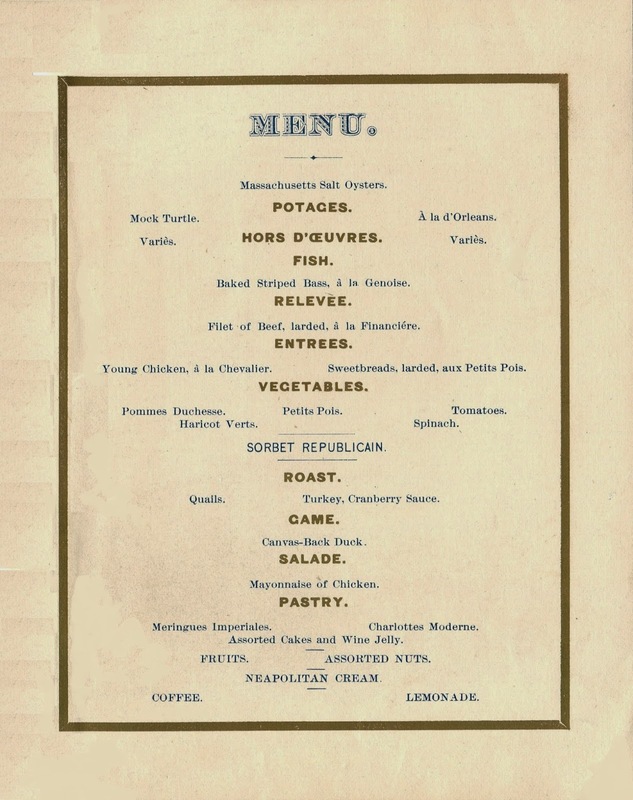 The unidentified banquet menu below, dated June 12, 1875, may have been printed for a private dinner party. The Centennial year was crowded with incidents that were dismal and defining. On May 10, President Ulysses S. Grant, now in his last year in office, opened the Centennial Exhibition in Philadelphia, the first official World's Fair in the United States. Over the course of the next six months, almost ten million people visited the exhibition, seeing for the first time in one place an enormous number of artifacts and goods that reflected the country’s budding consumer culture. Fairgoers were also presented with a wide selection of places to eat. In addition to French, Jewish, Turkish, Viennese, German and American restaurants, there were numerous cafés and light refreshment stands selling everything from popcorn to Brazilian coffee. In late June, while the great fair was in full swing, the nation was stunned by dispatches from Montana reporting a unit of the Seventh Cavalry Regiment had been slaughtered by warriors from several tribes in what became known as Custer’s Last Stand. 1876 was also the year of the disputed presidential election between Democratic Governor Samuel J. Tilden of New York and Republican Rutherford B. Hayes of Ohio. Four months later, the bitter conflict was finally resolved in a backroom political deal that awarded the victory to Hayes. In return, the Republicans agreed to withdraw federal troops from the former Confederacy, abruptly ending Reconstruction and with it, black enfranchisement in the South. 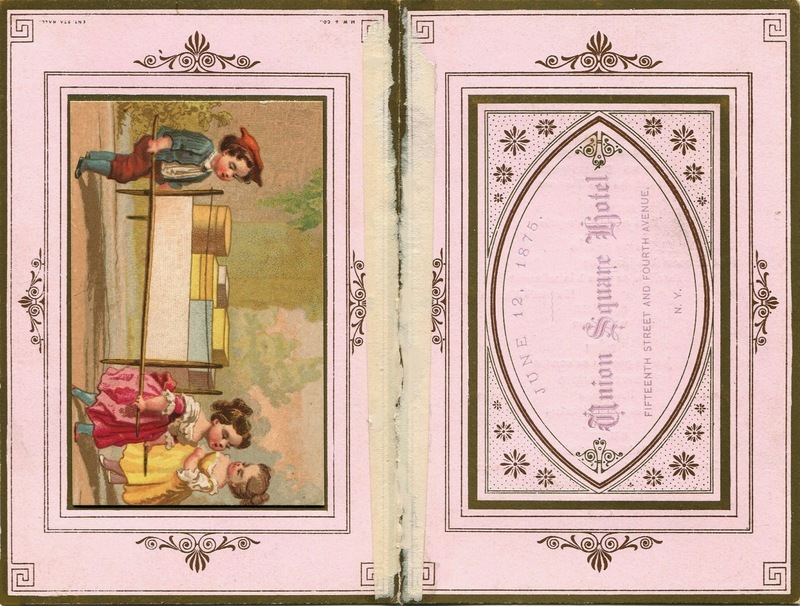 Beginning in early 1876, many of these menus bear the initials “B & C,” showing they were printed by Borden and Cain. 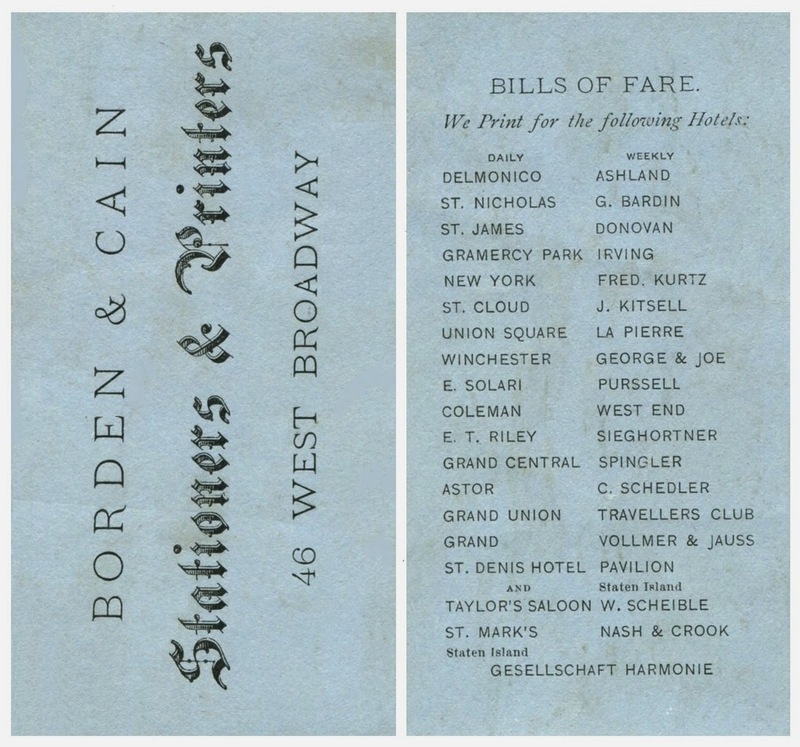 The contemporary trade card below (not found with the Sivori menus) provides the names of thirty-six hotels and restaurants in New York that purchased their daily and weekly menus from this stationer on West Broadway. 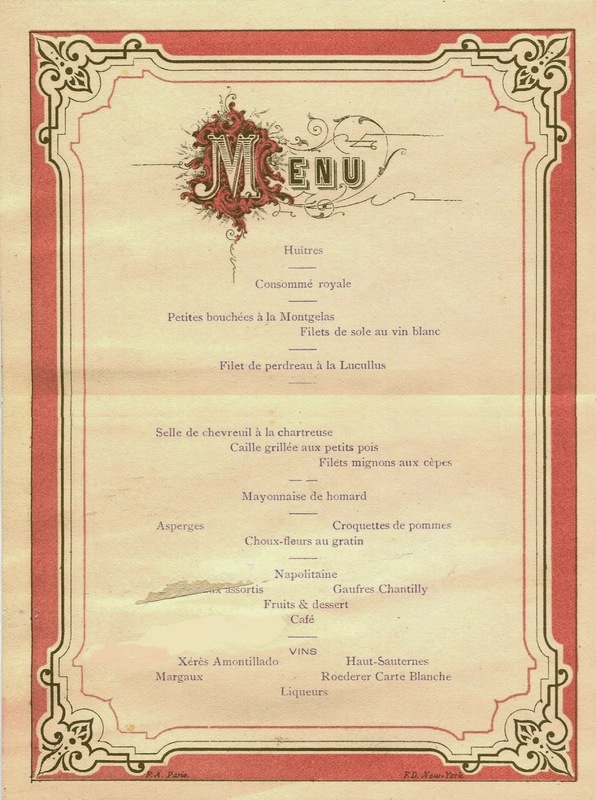 The bill of fare below is most likely a fragment of the original menu. 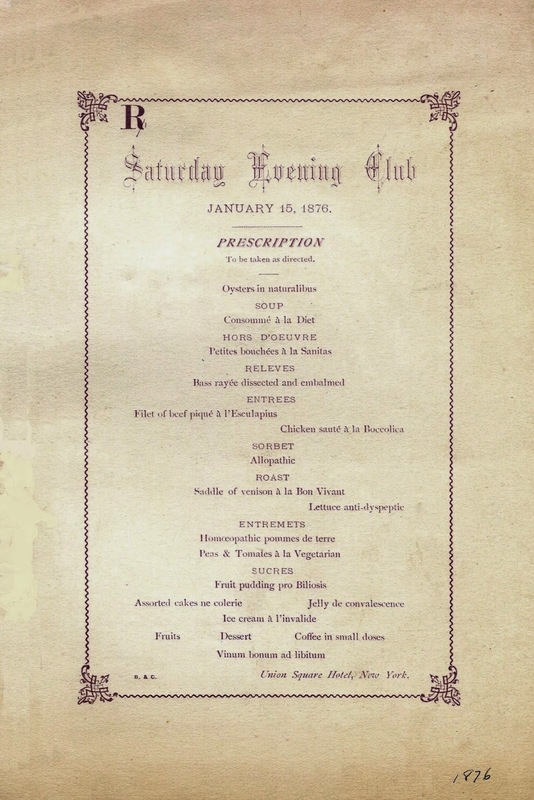 Dated January 15, it displays the prescription symbol “Rx” and several theme dishes, indicating that the “Saturday Evening Club” was associated with homeopathic remedies, an alternative form of medicine then at the height of its popularity. 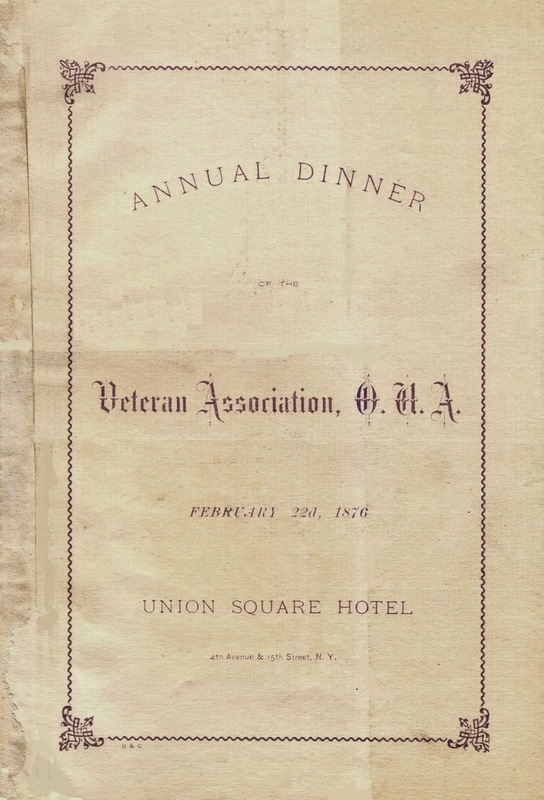 The Veteran Association of the Order of United Americans held its annual dinner on Washington’s Birthday in 1876. A week earlier, a winter storm destroyed the Great Elm, a popular tourist attraction on Boston Common that symbolized the Revolution. According to lore, the Sons of Liberty hung lanterns from its branches during the fight for freedom. The ill-timed loss of this ancient tree confirmed that the country was indeed getting older. 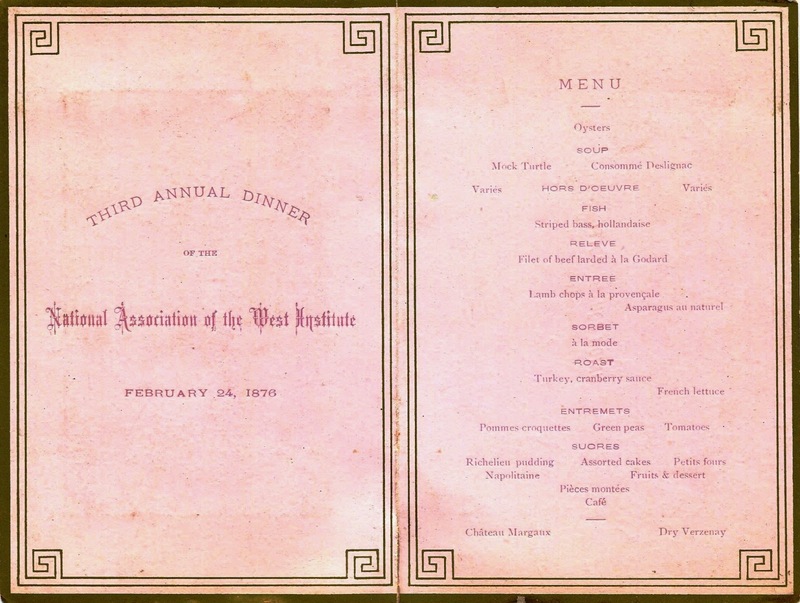 Two days later, the National Association of the West Institute held its banquet at the Union Square Hotel. In the next post, the story of Antonio Sivori will conclude at the Academy of Music, the venue for which he was most remembered, for it was there that he catered many of the city’s prestigious charity balls. 1. Six of the regiment’s nine companies were predominantly French. Some of the men were veterans, having served in the French Army in Algeria, the Crimean War and Italy. The rest were German, Irish, Spanish and Italian immigrants. New York Times, 7 January 2012. 2. American University now occupies the site where Ft. Gaines once stood. Across the street is the campus-like headquarters of the Department of Homeland Security. 3. Never a large regiment, the 55th New York was devastated in the Peninsula Campaign, and later consolidated into a four-company battalion of the 38th New York in September 1862. Interestingly, military records show that a native of Genoa named Constantine Sivori also served in the 55th New York Volunteer Infantry. Wounded at Fredericksburg, Second Bull Run, and Antietam, he mustered out on 23 December 1862, and died in 1864, reportedly of injuries received while on active duty. Constantine Sivori may have been related to Antonio Sivori, perhaps returning with the caterer after his supposed visit to Italy in the late 1850s. 4. Peter Cooper, the philanthropist who presided at the women's graduation ceremony at Grammar School No. 14 in June 1875, ran for president the following year as the candidate for the Greenback Party. He did reasonably well in the election, receiving 80,000 votes, primarily from those citizens most affected by the severe depression. You are constructing a life and times out of these remarkable pieces of paper. Amazing work, Henry. Henry, I love how much social history -- residential hotels, women working -- you included, and also the Western context of 1876. 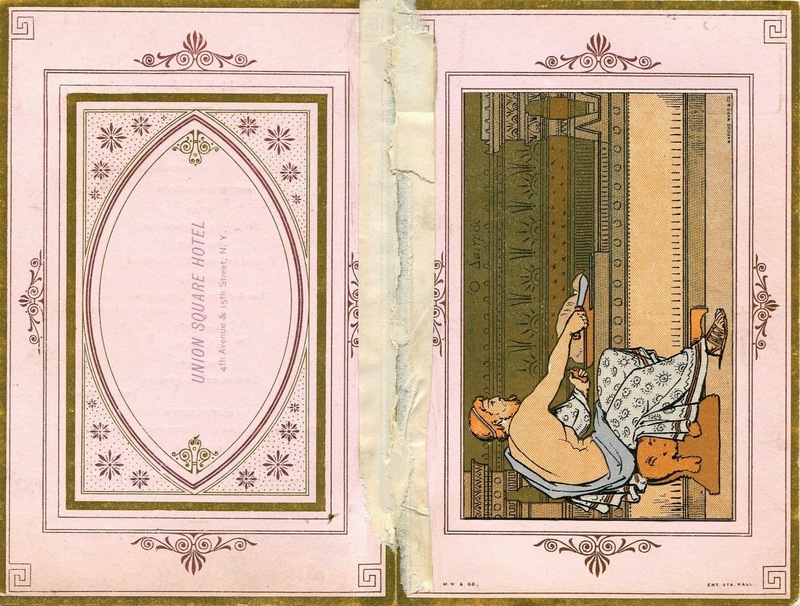 Plus, that little printer's trade card was quite a find. More interesting than ever and as always delivered with the trademark calmness of tone and accuracy of language. 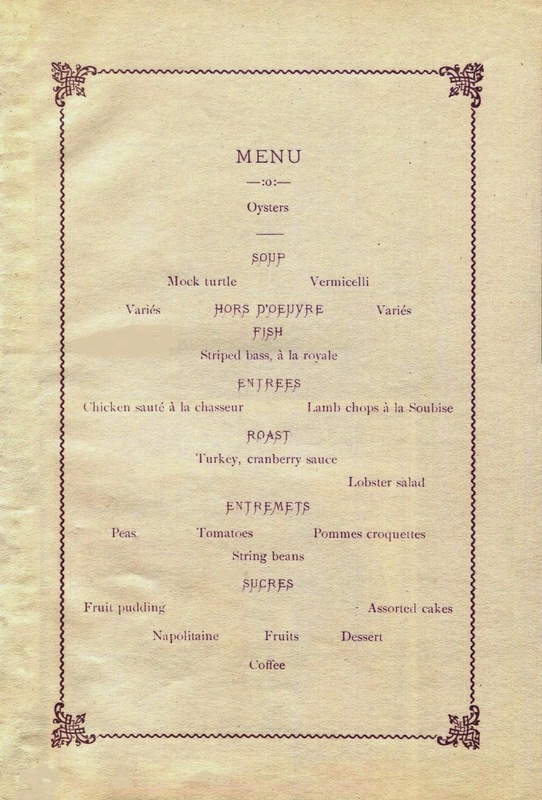 The humour of the menus is something almost completely lost today. 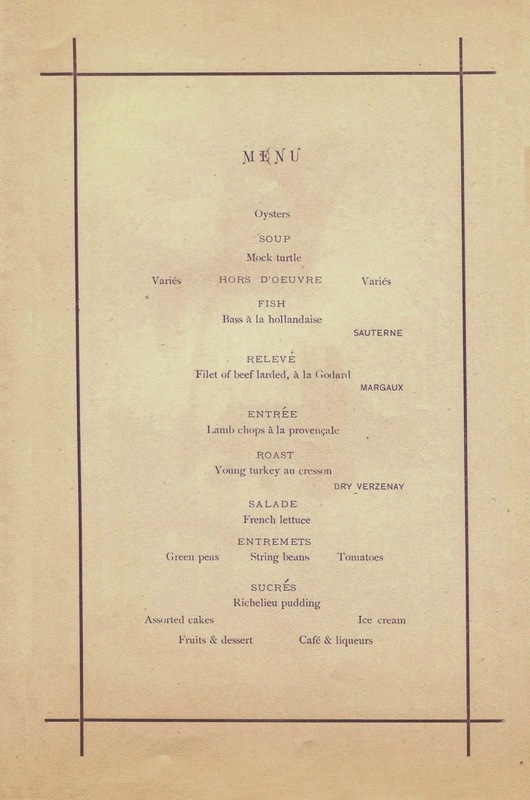 The relative formality of the dinners, even those held by workaday associations or for commonplace occasions (grammar school anniversaries), is striking. 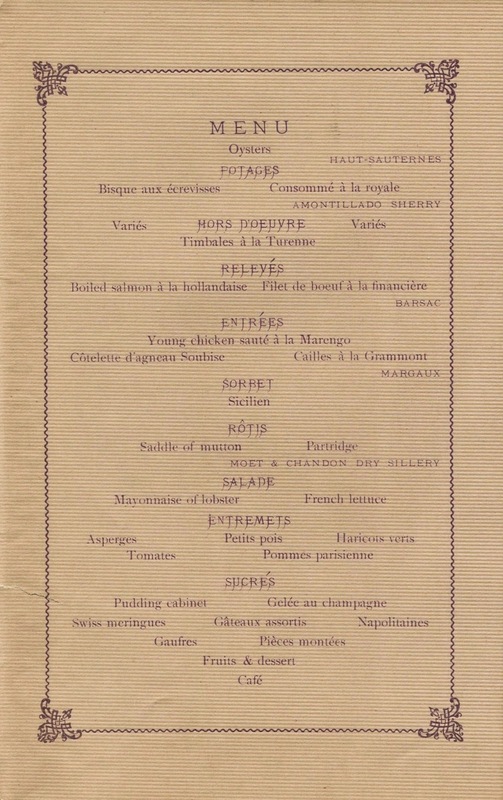 Interesting that Chicken Marengo appears for one of the latter events: I'd have thought it more suitable for one of the regimental dinners, but then too one can see that the associations might have been too fraught in this context. Young chicken in watercress. Good old veal Milanese. Leg of venison. Barzac. Extra Dry Champagne. (Leave the "ortolans" aside though). I'm in!